Many individuals, organizations, and agencies are pursuing big dreams for a revitalized Muncie. Check here for the latest resources available in our community. Need to call the gas company or have an emergency? 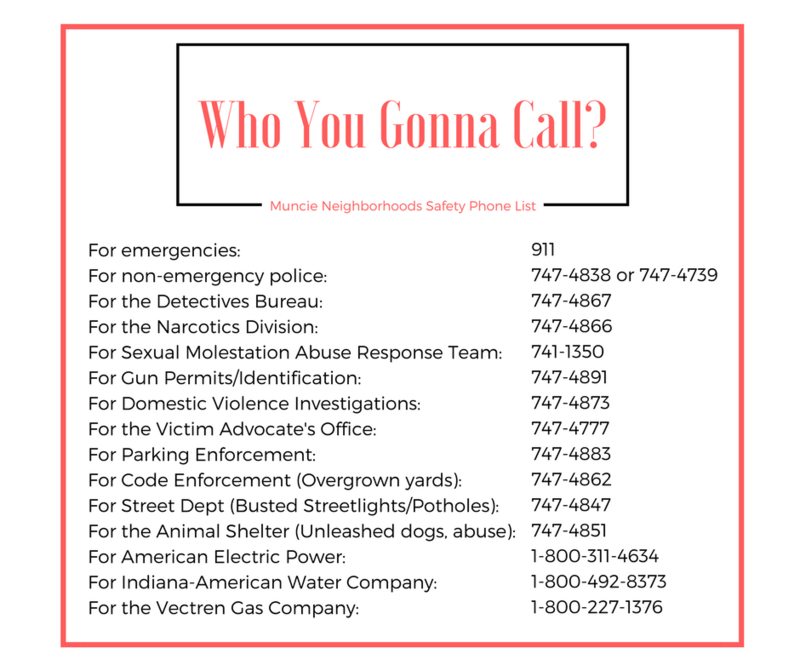 The Whitely Neighborhood has created an excellent list of the most common numbers you may need for assistance in your neighborhood. A guide to forming and maintaining a neighborhood association, with sections addressing issues and challenges faced by neighborhood organizers, and a collection of ideas and resources. This online booklet is part of a series of publications of the Indiana Chapter of the American Planning Association to be used as training materials for citizen planners: plan commission members, board of zoning appeals members, neighborhood organizations, and citizen committees. This online directory of more than 260 organizations and service providers in East Central Indiana is provided by A Better Way Services, Inc. Popular categories include addiction, child care, counseling, disability, education, elderly resources, financial assistance, health & wellness, housing, mental health, food assistance, support groups, women’s health, and youth services. Browse information from the Muncie Police Department on the best ways to pursue safety in your neighborhood. Gardens can be a great way to beautify your neighborhood, mitigate small scale flooding and drainage issues, and even produce fresh food for the community. This partnership between homeowner residents and the city of Muncie aims to restore and replant city trees. Residents can order a free tree from Muncie Urban Forester to plant in right-of-way public parkways. Connect2Help 211 offers an annual resource guide on social service and government agencies that serve Delaware County. They also publish reports on Delaware County’s use of 2-1-1 services. The St. Vincent de Paul Society of Muncie’s guide to human services available in Muncie and Delaware County serves as a supplement to the 211 Rainbow book. Edible Muncie aims to provide comprehensive information about food assistance to individuals and families who need to access such services. NextDoor is a private social network open to each neighborhood’s residents. Check it out to engage in local discussions. This website (still in development) lists resources related to sustainability in Muncie and Delaware County. Supported by the Building Better Neighborhoods Initiative and Muncie Action Plan. 37 measures of health, the factors that shape health, and drivers of health equity to guide local solutions for 500 U.S. cities. This resource guide, developed by Ball State’s Fisher Institute for Wellness and Gerontology in collaboration with A Better Way, was funded by the Ball Brothers Foundation. The Healthy Community Alliance of East Central Indiana is to improve the health and well-being of the communities we serve. On this website you can explore community data, create reports, and check out their other tools and resources. Learn how to identify realistic goals and become empowered to achieve them. Join a team of experts who will help you get to the source of your obstacles. Connect with community resources and work one-on-one until your health and well-being goals have been achieved. Map: What Story Does Your Neighborhood’s Life Expectancy Tell? To search for the life expectancy in a certain place, just type in an address. Hover over the result, and the map shows how your neighborhood compares to the county, state, and the country. A comprehensive and citywide Historic Preservation Plan mimicking the initiatives outlined by the Muncie Action Plan to provide a range of preservation planning and policy options. MAP is a community-developed strategic plan that promotes, supports, encourages, and assists in the development and enhancement of the quality of life in Muncie, Indiana. This strategic five-year framework guides economic development in Delaware County. The East Central Indiana Regional Development Plan is an eight-year roadmap for more than $147.9 million in development throughout the ECI region. The plan fueled proposals to the state as part of the IEDC Regional Cities Initiative. This plan, prepared in 2000, focuses on seven key areas affecting the physical development of Muncie-Delaware County with plans for implementation. This plan guides the continuous development of an integrated intermodal transportation system that facilitates the efficient, effective, and environmentally sound movement of people and goods. The goal of this master plan is to provide direction for continued improvement to the park system and recommend sources for alternative funding so that the park system can thrive.